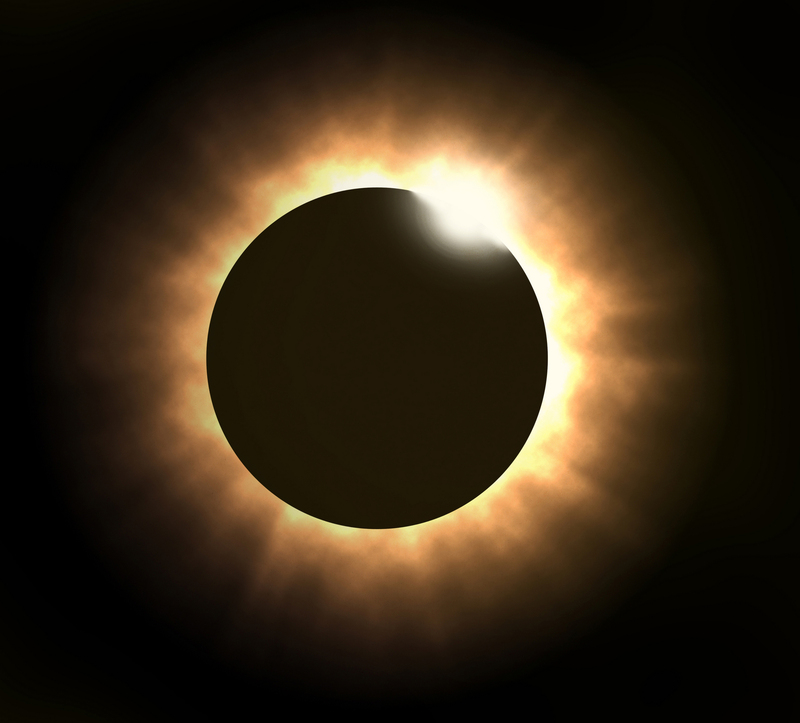 In March of 1970, there was a total eclipse of the sun, visible in New England. It was a beautiful Saturday, about noon, when my family went to the top of a hill for a good view. My mother told me that the moon was going to cover up the sun, and it would get dark. I found that hard to believe, and thought she might be wrong about this eclipse thing. She told me to be careful not to look directly at the sun during the eclipse, because the light was so strong it would hurt my eyes. How could that happen? It was so far away, how could it hurt me? I was a contrary child—at least in my thinking—but I did what she told me to do. I ran and played until it began to get dark, which happened very gradually. We watched the eclipse through a primitive pin-dot camera: holding a piece of paper or cardboard with a pinhole, the image of the eclipse was projected on another sheet below it. We also used a shoebox more or less the same way. The whole eclipse took a couple of hours. It was a strange and lonely experience. The birds stopped singing, and the day became silent, cold and dark. Darkness is most often seen as a problem in our lives. 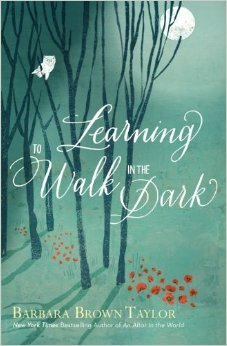 Barbara Brown Taylor, an Episcopal priest, professor and one of the best current writers about spirituality, has just published a book called Learning to Walk in the Dark. I heard an early reading of the book, and have been yearning to lay hands on a copy for a whole year. Barbara says that Christianity has very little use for the dark—it is a shorthand symbol for sin, spiritual blindness, ignorance and death. There are churches that operate with what she calls a “full solar spirituality.” What she means by that is that some church people have a sunny certainty that if something bad happens, all you have to do is pray and have faith, and God will fix it. Barbara says she would love to live in that world, but she doesn’t. There have been times when whatever sadness fell upon her wasn’t fixed by prayer and faith. As the trouble lasted, these well-meaning people began to back away. They either blamed her for lack of faith, or were unable to deal with this challenge to their certainty about how God works. Barbara says she is blessed with a lunar spirituality, one that experiences God in different ways over time. God’s presence can be full, or a thin sickle rising, or completely dark. In her experience, and in mine, God is not only present in the dark, but sometimes the dark times bring you closer to God. Learning to walk in the dark means drawing on your spiritual maturity. Neither author refers to Jesus’ death on the cross as a ‘Sacrament of Defeat,’ but I see a connection. In the language of the church, a sacrament is an “outward and visible sign of an inward and spiritual grace.” The sign of the cross offers us grace. It offers us hope. If it did not, then the Good Friday service would be a funeral worse than any other. But we do have hope that comes to us on this dark night of the soul. Nobody goes looking for a dark night of the soul, it comes upon you. When I think about the darkest night of the soul, I think of the Holocaust: the genocide of six million Jews during World War II. That dark night doesn’t feel as far away as it used to, because recent news reports are full of hostility and violence against Jews. There are stories of attempts to frighten whole Jewish communities. It is tragic that our holy scriptures, including the Gospel reading for Good Friday, may seem to condone this terrible persecution. Let me be clear: there is no justification for anti-Jewish hostility in our faith. The scriptures are not an indictment of all Jewish people of Jesus’ time, and they are not talking about our Jewish brothers and sisters now. This hostility has to stop; it is un-Christian. When the dark night of the soul descends, you have to ask yourself: what do you believe? I don’t mean: what do you affirm intellectually? Not: what do you retain from Sunday school? Not: what is your religious doctrine? I mean ‘believe’ in the older sense, from the German root word: Beliebe, to belove. What do you ‘belove?’ What do you set your heart on? What do you give your heart to? What is the hope that gives meaning to your life? God is present, even in the darkest places in our lives. God can reach you even if the opening in your heart is the size of a pinhole. God’s grace in the light and in the dark will give you a hope which can never be eclipsed. This entry was posted in Gospel of John and tagged anti-jewish, Barbara Brown Taylor, Good Friday, Learning to walk in the dark, spirituality. Bookmark the permalink.